Vyoma Shah is fascinated by the word ‘euouae’. Though she doesn’t know its meaning, Vyoma is intrigued by its usage. Her all-time favourite all-vowel word though is ‘euoi’, which denotes the ecstatic cry of the Bacchantes—in Greek mythology, the female devotees of the Roman god Bacchus. These words are so rarely used that you wouldn’t find them in an Oxford English Dictionary. But 15-year-old Vyoma has other uses for rare words. She is a Scrabble player. And in Scrabble, ‘euouae’—the name of a Gregorian cadence—is not a high-scoring word, but it allows players to clear a rack of excess vowels, and is therefore highly valued. “Scrabble uses a lot of words we don’t know, but it’s important to know as many different ones as possible if you want to win," says Vyoma. It is the sort of knowledge that just might help this Dhirubhai Ambani International School student become the next world youth Scrabble champion. Vyoma, her 11-year-old brother Purav and 10-year-old Druv Garodia will represent India at the World Youth Scrabble Championships in Malaysia in December. “You need to think and play, but you also need a little bit of luck to win," says Garodia. The first part of that winning equation takes a lot of practice, which the Shahs get every day by playing online at the Internet Scrabble Club. “The minute they enter the house, the games are out," says their mother Sangeeta. “Also, they play while doing research on the Internet," she says. Mothers are not usually complicit when it comes to their children playing while studying but, according to Sangeeta, the game has helped her children become observant, expressive human beings and better students. “Scrabble helps you strategize and think ahead about how your opponent might play his next move," says Vyoma, who also plays chess, draws, elocutes and attends pre-SAT classes. “Plus, you have to learn a lot of new words to be able to win, which improves your word knowledge." The Shahs have been playing Scrabble for the past three years, and they are coached by a professional Scrabble instructor. It is the sort of serious interest that has taken Scrabble out of parlours and into the stream of sporting activities. In India, even though it is still considered just another board game by most people, according to P.C. Jose, chairman of the Scrabble Association of India, the game has gained such popularity in the last couple of years that now there is a tournament played every two months. “We started in 1996 with just 20 people, now we have about 700 members." And this is an important year for Indian Scrabble. For those of you who have been straining your eyes on the goings-on at Mumbai’s Wankhede Stadium, it will be a surprise to know that the 2007 World Scrabble Championship, which is the adults’ game, will be held between 9 and 12 November at Mumbai’s Taj President hotel. Eighteen-year-old Sherwin Rodrigues is one of four contestants who will represent India in the championship. 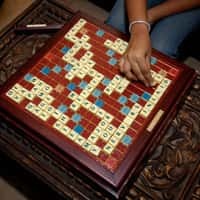 The second year B.Com student from Mumbai’s HR College, who also coaches kids in the game, says Scrabble deserves a lot more sponsorship and encouragement. “Right now, very few parents like to send their kids for international championships because there’s no sponsorship, and even the winnings are not big enough for them to make the investment." Last year, the World Youth Scrabble Championships went unrepresented by India because parents weren’t interested in sending their wards. This year, the Shahs and Garodia—all three children are national-level players—were asked by the Mumbai Scrabble Club to represent the country. Their parents will fund the project. “If we didn’t send someone this year, we would have lost our seat for the next championships, so we decided the kids should go and try," says Sangeeta.